From the front, you'd be forgiven for thinking this is the iPhone 7. 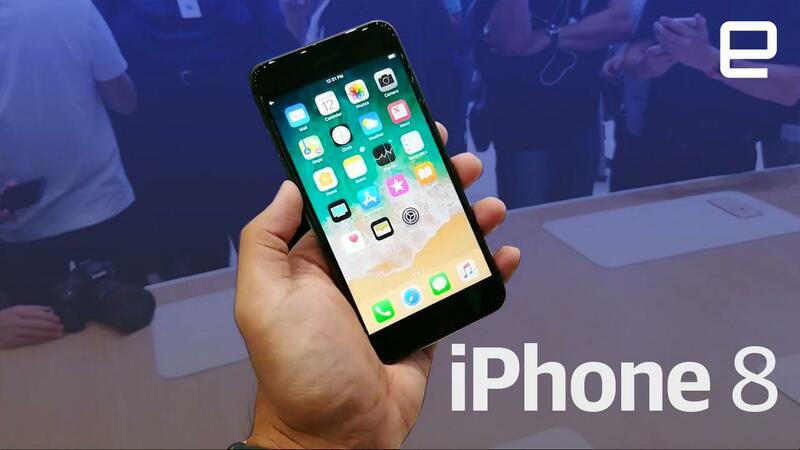 While the iPhone 8 and 8 Plus aren't a complete redesign like the iPhone X, there's still plenty to dig into here. For starters, the new phones take the glass-backed design that is also in the X -- a move that makes them work with wireless charging. But from the front, they're basically indistinguishable from all of Apple's phones all the way back to the iPhone 6, which first came out in 2014. The larger bezels are still in place here, as is the home button, something that should make change-averse iPhone users happy. I realize most people are probably drooling over the iPhone X, but make no mistake: the iPhone 8 and 8 Plus have important jobs to do. They have to keep the lion's share of the world's iPhone users happy while Apple gets more experimental with its thousand-dollar phone. After a little bit of playtime, I don't doubt that people will ultimately enjoy Apple's conventional new iPhones -- they just might not be too excited by them. That's because, design-wise, Apple didn't get particularly adventurous with these things. Sure, they both now sport glass backs in addition to glass fronts to make wireless charging possible. And true, both are available in a pretty sweet gold hue that looks a little... creamier than the gold finishes we've seen in the past. With all that said, Apple stuck to the same screen sizes -- 4.7 inches on the 8 and 5.5 inches on the 8 Plus -- and both devices are a little thicker and a little heavier than the devices they replace. Is the difference really noticeable? Well, partially: The iPhone 8 is still comfortable to hang onto but the 8 Plus is now especially unwieldy. At least both versions of the iPhone 8 come with more storage out of the gate -- Apple made 64GB of storage the floor for these things, and it's about time. It's always hard to gauge performance while fighting other journos for hands-on time, but the iPhone 8 and 8 Plus sure seem to bring the good stuff. General navigation was as slick as always, and a couple of included AR demos ran well too... once I went back and closed a few apps. Still, that's pretty impressive considering this was unfinished code running on unfinished hardware -- the nearly imperceptible lag was a testament to the kind of horsepower the new A11 Bionic chipset brings to the situation. And as usual, people who splurge on the bigger phone get the better camera. The few test shots I grabbed with the iPhone 8 were nice enough, but the 8 Plus' dual camera basically sucked the air out of the room. That's all thanks to the improvements Apple made to its Portrait mode: In addition to snapping shots with the appropriate amount of bokeh in the background, 8 Plus owners can play with some incredible lighting settings. Trying the feature on Apple's preloaded test photos was sort of a revelation -- while other dual camera makers have recently made big strides in performance, Apple's skill with software means the 8 Plus will probably have the dual camera to beat. All told, it's not hard to look at these things as the iPhone 7S and 7S Plus. They're not. Despite what their looks may suggest, there are some serious improvements on display here and I suspect the upgrade will be well worth it. Who knows? If the iPhone X does well, this might be the last time you'll able to own an old-school, home-buttoned iPhone.